Welcome to The Amareece School of Dance. We have been running since 2006. Our classes are taught by highly professional, qualified teachers and have a fun and friendly atmosphere. We teach the I.D.T.A syllabus in tap, street, theatre craft and ballet. Students are encouraged to take exams in their subjects and progress through the grades although this is not compulsory. Qualifications with the I.D.T.A also now hold UCAS points for help in the furthering of the students education. Exams are not compulsory but the majority of our students take them and we have a 100% pass rate since 2006 with excellent results. We do bi annual shows at The Harlequin Theatre, Redhill and are proud to say that our students have appeared in pantomimes and travelling theatre shows many times. We also support the community and take part in the Caterham festival and parade. So what are you waiting for?! Come and join us for a free trial class. Send your enquiry and I will get back to you with any questions you may have. Miss Sarah and Miss Holly have a friendship that spans over 20 years now. Miss Holly joined the school in 2008 and is now the Vice Principal. Their friendship ensures that every class is taught with plenty of love and laughter to help instill their passion of dance to their students. Sarah AKA "Miss "Mad" Sarah"! has been teaching for 20 years. She began her training at The Grove School of Dance and completed her teaching qualifications at The Phillomena Dance School. 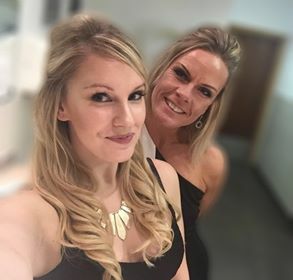 Before taking her dance career seriously Sarah gained a BA Hons degree in Hospitality Management and was an area manager and hotelier around the UK. Sarah now has over 39 years dance experience and is now a Fellow of the International Dance Teachers Association. Sarah is also qualified in Clinical Personal Fitness Training and Sports Injuries and is a British Cheerleading Association examiner. Sarah has owned and run "The Amareece School of Dance" in Caterham since 2005. Sarah has appeared in an Elvis Tribute tour as part of the Tupelo Dance troupe and has successfully choreographed shows at the Harlequin Theatre, Redhill, for many touring dance companies. Sarah is a qualified teacher at Secondary Level and currently is the Head of Dance at The Priory School, Dorking. She teaches in Key Stages 4 and 5 and is a BTEC specialist at the school. I love my dance class because the moves are made with cool names. We are also given the chance to show our potential in shows and exams, plus they're optional which makes it even better. I also love the personalised Amareece Hoodies and Zoodies. Miss Sarah and Miss Holly are fun, caring and understanding. My children have been dancing with the Amareece School of Dance for more than 10 years. Miss Sarah is a brilliant teacher with a great sense of humour. She manages to find the balance between teaching dance to the highest standard but keeping it fun too. There are many opportunities to take exams but they are not compulsory. Every 2 years there is a show which all the students are able to take part in. This is very professional with amazing costumes and dance numbers. Miss Holly now teaches alongside Miss Sarah and is very popular with the students. She also shares Miss Sarah's sense of fun and humour and together they make a great pair. I cannot recommend the Amareece School of Dance highly enough if your children want to learn dance in a calm but fun atmosphere. Our daughter Issy has been attending the Amareece school of dance in excess of 4 years. Under the expert tuition of Miss Sarah and Miss Holly we have seen Issy grow and become not only more confident in her dance but in her own capability and character. Amareece is far more than a dance class, it is truly a family affair and this is evident in the fact that Issy will not leave without a big hug from Miss Sarah at the end of each lesson. My daughter's have been dancing at Philomena for over 8 years and they love it! They have taken numerous exams and been in 4 shows, with another coming up in July. They have great fun and it gives them confidence. Any personal information collected on this site will be kept strictly confidential and will not be sold, rented, disclosed, or loaned.